I started with a master almond paste recipe, that I used for all three, with the addition of chocolate chips and cherries to some of them. Pretty simple and oh so yummy. Unroll the puff pastry sheets (or roll out into a square if you have the version that isn't rolled out yet), and cut each sheet into 6 squares for a total of 12. To make the almond filling, combine the ground almonds, icing sugar, butter, 1/2 tsp of almond extract and egg white in a bowl. 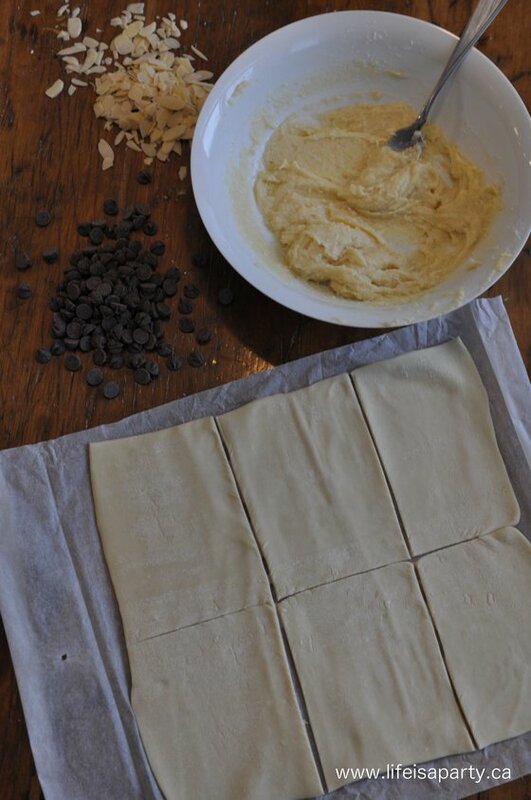 Divide the almond filling equally among the 12 squares. To make 4 Almond Danishes, fold two of the corners over, using the egg yolk as the glue, and also as a wash over the top. Sprinkle with some sliced almonds. To make 4 Chocolate Almond Danishes, sprinkle 1 tsp. 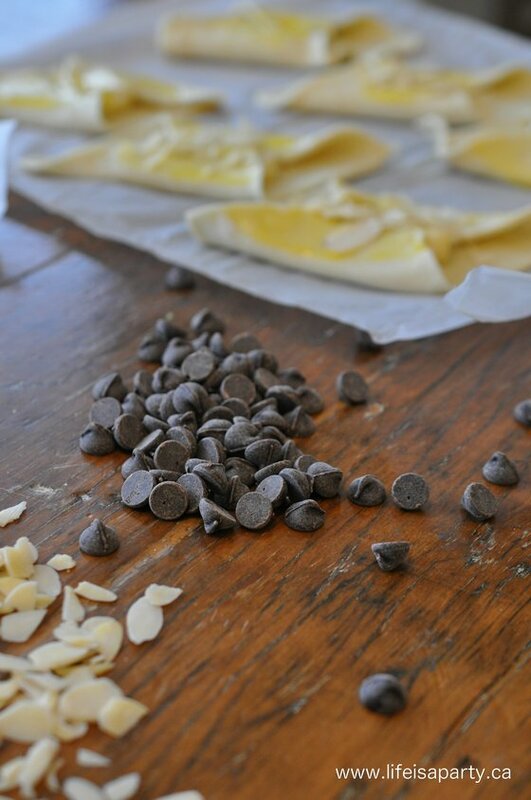 of chocolate chips each, over top of the almond filling on 4 squares, and then fold the corners using the egg yolk wash as glue and over the top again. 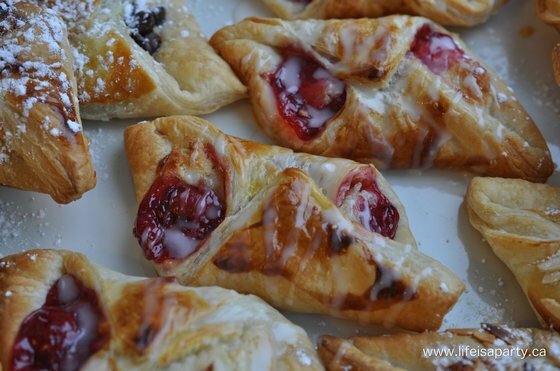 To make the 4 Cherry Almond Danishes, add 1 tbsp. of cherry pie filling over top of the almond filling, and fold the same way as the others. Bake the Danishes at 400, for about 12 min. until golden brown. 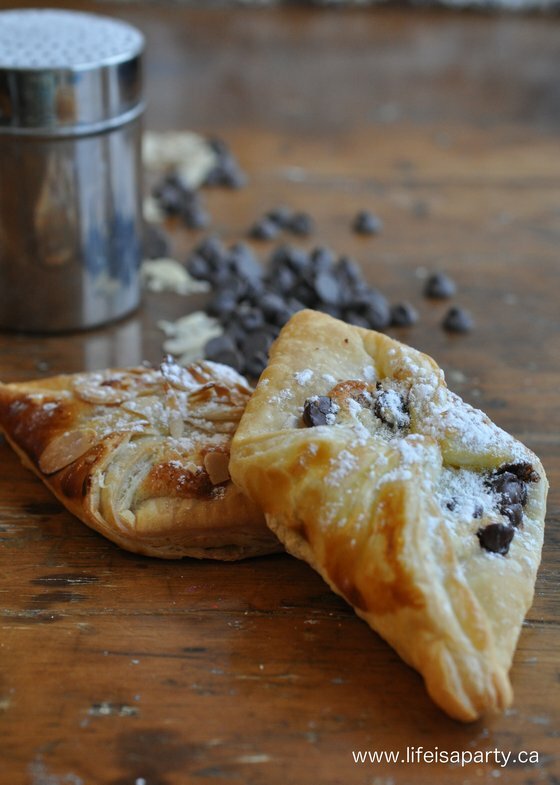 Let the Danishes cool, then sprinkle the Almond and Chocolate Almond with a little icing sugar. To make an almond glaze for the Cherry Almond Danishes, combine 2 tbsp of icing sugar with 1/2 tsp of almond extract, and 1 tsp of milk and stir to fully combine. Drizzle the glaze over the cooled Cherry Almond Danishes. 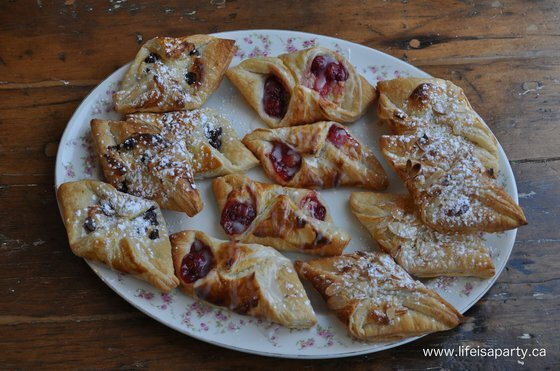 You should pick up a little puff pastry this week when you grocery shop, and whip up some of these on Saturday morning, your family will thank you. 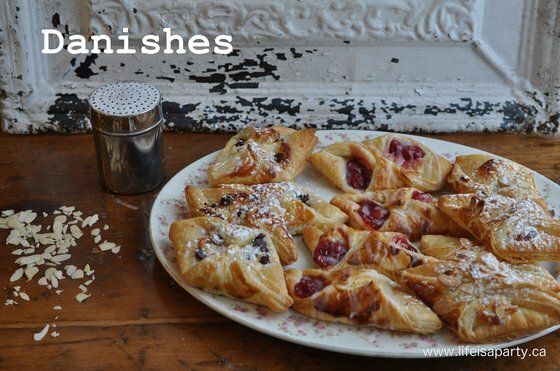 With fresh, homemade danishes, life really is a party. This post is linked up at the Weekend Re-Treat Link Party, and The Inspiration Gallery.